West point of Sattarah. Plate 4 of 'Eight Most Splendid Views of India, sketched by an Officer in the Indian Army', published by Baron A Friedel, London, 1833.
bl.uk > Online Gallery Home	> Online exhibitions	> Asia, Pacific and Africa Collections	> West point of Sattarah. Plate 4 of 'Eight Most Splendid Views of India, sketched by an Officer in the Indian Army', published by Baron A Friedel, London, 1833. 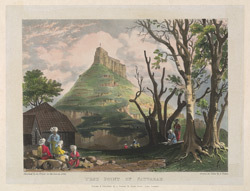 Coloured lithograph of the fort at Satara in Maharashtra by A. Picken from an original sketch by Baron A Friedel and plate 4 of Friedel's 'Eight Most Splendid Views of India, sketched by an Officer in the Indian Army' printed in London in 1833. Satara is situated south of Pune in Maharashtra in a valley between two hills near the confluence of the Kistna and Verna rivers. The fort, seen in this view, was a principal centre of Maratha power in the 17th and 18th centuries. In the 19th century, the British established a cantonment at Satara and the Residency was used by the British colonial administrator, Sir Henry Bartle Frere (1815-1879).